Experience the enchanting beauty of England and Wales. During your 7-day trip discover the highlights of the bustling capital of the United Kingdom, London, and see the best of inspiring Cardiff & Conwy. As an unforgettable hallmark of the trip traverse the breathtaking Valleys of Wales, explore Snowdonia National Park and rise to the peak of Mount Snowdon on the Snowdon Mountain Railway. Welcome to the incredible capital of the United Kingdom - London! Upon arrival, your driver meets you at the airport and assists you to your hotel for check-in. 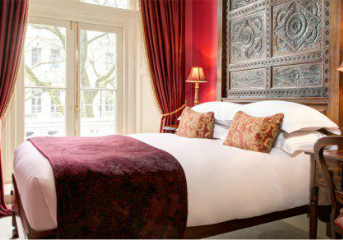 Following breakfast in your hotel, you begin to explore the iconic landmarks of London during a comprehensive 4-hour guided tour. We have booked a day pass for London tube for you, so you can experience famous London transportation system and save time on traffic. Together with your professional guide you begin your tour with the legendary Tower of London. Your tour continues with a walk to the absolutely unmissable must-sees of the city: the 700-year-old Westminster Abbey and one of London's most famous landmarks - the Houses of Parliament's iconic clock tower Big Ben, officially known as Elizabeth Tower (entrances to the Tower of London and Westminster Abbey are included). After the tour you return back to your hotel. The rest of the day is free for you to continue exploring London. Please note: if your travel dates are from July 21 to September 30, 2018 you can optionally add the entrance to Buckingham Palace. Today after breakfast you check out from your hotel in London, meet your private driver who transfers you to the Paddington Train Station, where you board a train for your 2-hour journey to Cardiff - the capital of Wales. Upon arrival you are picked up by your driver and taken to the hotel to drop off the luggage. You then meet your tour guide in the lobby for a walking tour of Cardiff. Your circular walking tour of the city center begins at the Pettigrew Tea Room. Today you get to see the world famous Animal Wall and stroll through a lovely Victorian shopping arcade and Cardiff’s bustling indoor market. After a glimpse of the old Glamorganshire canal, you carry on to the beautiful Bute Park. After a short tea/coffee break head down the river Taff by water bus to Mermaid Quay, passing Cardiff Arms Park and the Millennium Stadium on the way. You also see the picturesque Norwegian Church, Scott memorial and the Pierhead Building. Following a lunch break, carry on to Victorian Gothic revival Cardiff Castle - one of Wales’ leading heritage attractions and a site of international significance. Located in the heart of the capital, within beautiful parklands, the Castle’s walls and fairytale towers conceal 2,000 years of history. During your group House Tour with a castle guide you see some of the fabulous interiors in the Castle Apartments including the Winter Smoking Room, the Nursery, Lord Bute’s Bedroom and the Roof Garden. You may carry on to the Clock Tower under request as it does have many uneven and steep steps. After the tour you walk back to your hotel that is minutes away from this historical monument. The rest of the day is at leisure. Today following breakfast you check out from your hotel and meet your driver-guide for an unforgettable trip to discover the incredible sites and nature of Wales. They say that you have not visited Wales until you have been to the Valleys – the Heart and Soul of Wales. Leaving from Cardiff you continue on to Brecon Beacons National Park, one of three national parks in Wales and one of the first ten national parks to be created in Britain. The park attracts numerous tourists from all over the world with its stunning valleys and countryside, wildly beautiful forests and wide open hillsides. You start exploring the park from the tour of Distillery Penderyn and learn why whiskey from the Brecon Beacons is sold throughout the UK and in more than 20 countries worldwide. The distillery is situated on moorland with a natural spring, and the water itself adds subtle minerals and distinctive flavor notes to the whiskey. You see the mill, the mash tun, the exhibition area and also taste a drink in the tasting bar afterward. You then carry on to Waterfall Country - one of the most popular and charming parts of the Brecon Beacons National Park. Together with your guide you visit a few waterfalls and enjoy the beauty of the woodland scenery. Later after about a three-hour drive from Brecon to Portmeirion, you arrive to your hotel located in a charming village near Snowdonia. You check in and have a good rest after an adventurous day. Please note: instead of visiting Penderyn Distillery you can ride on Breacon Mountain Railway. Please contact your travel specialist for more details. Breakfast and whiskey tasting included. In the morning after breakfast and check-out, you are met by your driver-guide and go on a day trip around the amazing Snowdonia National Park area. Your day starts with a drive to the Caernarfon Castle which was the most expensive castle an English king ever built. The Castle is famous for its physical grandeur and is associated with the prince of Wales. In 1911, Caernarfon Castle was firstly used for the investiture of the Prince of Wales, and again in 1969 Queen Elizabeth II's son and heir, Prince Charles, was crowned here. You have a group tour with a castle guide to see the interiors of the Caernarfon Castle and then explore the petite fishing town of Caernarfon, wrapped within the castle’s mighty stone walls, with your private guide. You continue to the stunning Snowdonia National Park. Upon arrival to Llanberis located at the foot of Mount Snowdon you have a scenic ride on Snowdon Mountain Railway. Your return journey takes about 2.5-hours, upon arrival up to the peak you find the visitor's center and a viewing platform. Your driver-guide then takes you to the hotel in the historical town of Conwy for check-in and overnight. Please note: the Snowdon Mountain Railway is available from May to October, 2018. After breakfast meet your driver-guide and embark on another exciting tour. At first you head down the beautiful Conwy Valley via Bodnant Gardens to Bodnant Welsh Food Centre, where you learn why the Welsh got a reputation of a nation passionate for food producing. You proceed to the beautiful village of Betws-y-Coed and then to the Ugly House, a cottage full of legends and mystery. You return on the western side of the valley to the medieval walled town of Conwy. Here you visit Conwy Castle which is considered by UNESCO as "the finest examples of the late 13th century and early 14th-century military architecture in Europe". You also explore the Smallest House in Great Britain which measures 1.8 m (6 ft) across, 3 m (10 ft) high and deep. After the sightseeing, you are taken back to your hotel and have the rest of the day free. Today is the last day of your adventure. Following breakfast you check out, your driver meets you in the hotel lobby and takes you to the Manchester airport for your departure. We wish you a safe flight and hope to see you again on our tours! Tracing the Welsh history while visiting medieval Wales’ leading heritage attractions.